Traditionally a frontal is rectangular in shape, but in the latter half of the twentieth century different shapes started to appear, including circular, semi-ovals and triangular forms. Often a superfrontal (sometimes called a frontlet) is used with the frontal. The superfrontal is the same width as the altar, but only about 25 cm deep. It can be of the same cloth as the frontal or in a contrasting material. The frontlet hangs in front of the frontal at the top of the altar and is fixed in place with hooks and eyes, loops, velcro, etc. Normally none of the superfrontal cloth comes on the top (mensa) of the altar. 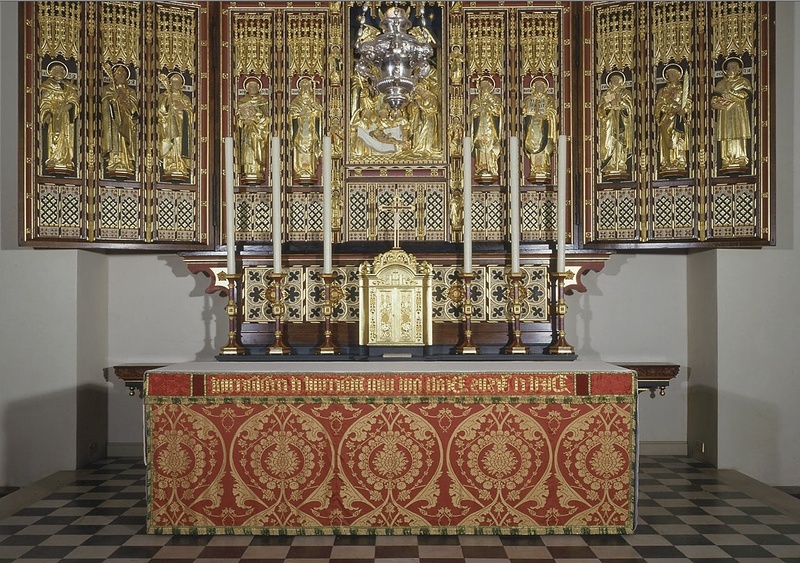 See also the TRC Needles entries on altar cover; dossal; laudian and laudian altar frontal; lectern fall; World War I frontal. Source: Shorter Oxford English Dictionary: 'Frontal'.